It's been a blur for the past few days. 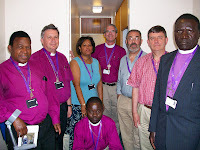 The photos on the page are my Bible Study Group, who have been a main community for me during this Conference, the women bishops in the Anglican Communion, and Westminster Abbey. On Thursday we went by bus to London. We marched on behalf of the M.D.G. 's (which is a campaign to change the world by such actions as eliminating global poverty and hunger). We heard Gordon Brown, the Prime Minister speak and then had lunch at the Lambeth Palace gardens. It was--to use the local term--splendid. We dined under a tent big enough for 1500 people and walked the gardens. Then we went to Buckingham Palace. You cannot take any cameras inside (hence no photos). I did talk to Prince Philip and saw the Queen. The gardens must be @15 acres in the middle of London. It was wonderful. As I watched her walk down the lawn protected by her guards, I realized how powerful our symbols are. The British don't need a queen for running their government, but they do need her for the symbolic unity of their identity. When they say "God save the Queen," it isn't just Elizabeth they are talking about; it's themselves projected onto her. 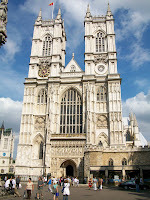 We also went to Evensong at Westminster Abbey. I sat next to the choir stalls and watched the tourists--most of whom were American--come in with hats and cameras and phones. Few looked as if they knew what was going on; they looked as if they came just for the building. Yet I wondered if God had brought them here to stir something in their souls; I wondered if a prayer or a chant or a reading might quicken something that had been dormant for longer than they could remember. Surely God uses the beauty of this building to bring God's children closer to God. I kept thinking as we prayed "for Christ's sake" that God has brought these people here for Christ's sake. Our Lord is happy when his children come together to give God praise. We have been talking about the environment and seeking how to combine our many efforts to be better stewards. My hope is that the Anglican Communion Office can help us be more intentional about coordinating the needs of the world with the resources. There is so much good being done but it is so patchwork. This afternoon (Saturday) we took the group picture. The final print will be like the Saturday Night Life piece of "Find the Pope in the pizza" Contest. 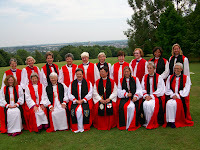 It was touching to see all the women bishops of the communion gather together, yet it's also sobering to see that they can easily be photographed by my camera. So much of this Conference is about our stories. A bishop told me he walks eight days for confirmations in his diocese. Another spoke of the many murders done by the governmental regime. It's all about seeing that we all live the One Story of Christ dying and rising over and over again. Tomorrow (Sunday) I'll go to Church in Canterbury.